Let the water boil for 5-10 minutes, the put in the glass noodles for 2-3 minutes or until it is softened and pliable. Drain off the water, rinse with cold water, drain. Place the scallops in a mixing bowl. Toss with salt and sprinkle some peach tea. Place the scallop in a steamer basket. Cover with a tight fitting lid. Steam it roughly for 4-6 minutes or until it is cooked. Remove from the basket, cool down in refrigerator. Slice into half after cool down. Use the remaining liquid from the lobster. Bring to rolling boil. Cook the prepared squid in the boiling water until opaque for roughly 40 seconds to a minute. Ice bath. Drain the water and dry on paper towel. Boil the water, put in the tea. Let it steep for 15-20 minutes. Strain the tea. But keep one teaspoon of the tea leaves to make the dressing. Pour the tea in a mixing bowl, add in the remaining ingredients. Mix well. 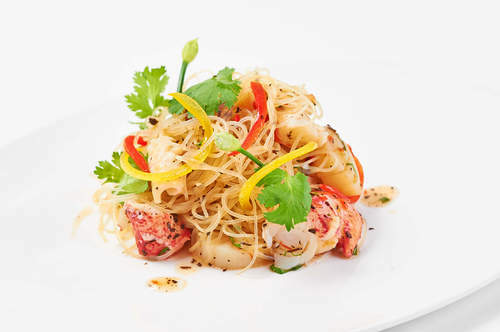 Put the glass noodles, seafood and the julienne capsicum in a mixing bowl. Pour in some of the peach tea dressing, taste and season with some salt if needed. Divide in a salad bowl, garnish with coriander leaf and chives flowers.